New Winter 2018: Share the joy of a newborn boy with parents this season or celebrate your own son’s arrival with this classically designed first Christmas ornament from Russell Rhodes. 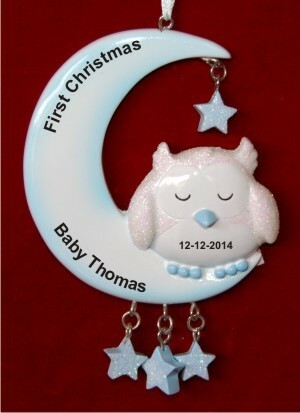 The boy baby’s 1st sleeping owl personalized Christmas ornament will delight with its half moon and cute bird accented with dangling stars. These are baby boy ornaments personalized for the child, so we’ll use a handsome, hand-painted font to add his custom details. There’s room on the back for a longer sentiment too. The result is a baby first Christmas ornament that’s a favorite now and grows in sentimental value each year. The owl and moon baby boy personalized Christmas ornament arrives in our plush gift pouch.